It’s a great time to be a data analyst. Businesses have the ability to collect and store more data than ever before. That means more opportunities for you to discover the insights that drive crucial decisions, cut costs, and generate revenue. These new possibilities present new challenges, too. You need to compile data from multiple sources in a variety of formats. You need the ability to manipulate the data to generate insights, and to create reports that make sense to your team members and decision makers. To help you unlock the potential of your organization’s data streams, Microsoft has published a new eBook: What Color Is Your Data? It’s a guide to the various types of data that organizations create, with real-life examples of how data analysts use each type to drive amazing results. What Color Is Your Data? can help you discover new ways to put your data to work, no matter what job function you have. Read What Color Is Your Data? 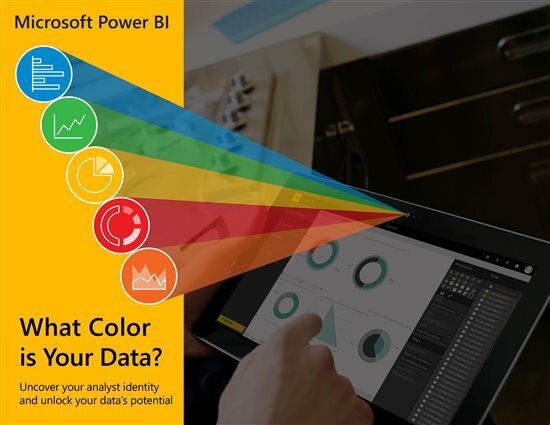 today, and start seeing your data in color.